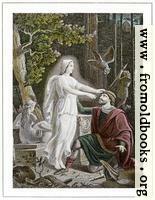 Some images from Legends of the Black Forest, published by C. Wild, Bookseller to the Court, baden (Germany), c. 1890. This 1890 book is a translation of the same book by Alex. Württemberger, according to the publisher’s preface. The engraver is not credited, but the pictures are of frescoes on the walls of the Trinkhalle in baden, and those pictures were painted by Jakob Gotzenberger (1802 – 1866). Although German copyright law gives the artist copyright for life and 90 years, the artist here died more than 90 years ago. The translater is not given credit, and, although I have not found dates for the author, I think it not unreasonable to suppose the text to be out of copyright since it is an anonymous work. But I am not certain, so you should feel free to use the pictures commercially if you like, but not the actual extracts. 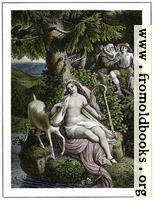 the pictures are signed by the publisher, Verlag C. Wild, and the location, Baden-Baden, but not by the artist. The stories seem to be gothic horror rather than children’s stories. I wouldn’t want to be thinking about them after a few beers! I bought my copy of the book at Renaissance Books UK in Broadford, on the Isle of Skye. 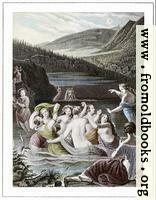 If the Website is down, they are closed for winter; see their abebooks store instead. Frontispiece: Burkard Keller of Yburg.